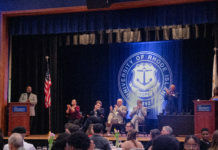 In an effort to improve the University of Rhode Island’s campus environment, the organization Student Action for Sustainability (SAS), is advocating for plastic reduction. Reducing the use of plastic, Iannone said, means asking yourself how we, as a community, can avoid using what we don’t need. “Everyone just takes and takes and they don’t realize, ‘hey, do I really need this?’ or ‘am I going to eat or drink a quarter of this and throw it out?’ because then it’s like why even bother in the first place,” Iannone said. In recent weeks, SAS has approached facilities management in individual buildings around campus and asked them about their current and future methods of plastic reduction. Iannone said that they are focusing more on individual areas of campus first in order to have a greater influence, rather than tackling the private communities like Dunkin Donuts or CVS Pharmacy.